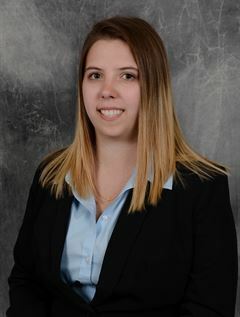 Cassidy Shaffer | Czekalski Real Estate, Inc.
Cassidy Shaffer joined the Appraisal Department with Czekalski Real Estate after graduating with honors from Clarion University with a Bachelor of Science Degree where she majored in both real estate and finance. In a short time period, she has already achieved her license to train towards her certification in real estate appraisal, and also completed all requirements for a real estate license. She has successfully completed the Dale Carnegie Skills for Success Course, which challenges students to master organizational communication and skills to handle fast-paced workplace changes. An avid learner, Cassidy not only had a dual major, she also successfully completed a minor in marketing. During her time at Clarion, she helped advance the Rho Epsilon real estate fraternity through educational pursuits. After graduation Cassidy was one of the local leaders asked to present at a Rho Epsilon meeting. FUN FACT: In Cassidy’s free time, she loves being outside at her Armstrong County home riding her horses and four-wheelers.